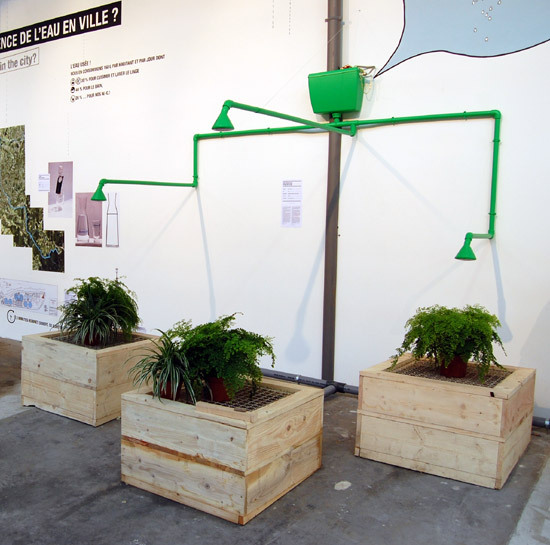 continuing with the theme of sustainability and green living, the ‘city eco lab’ had a couple of possible solutions for the collection of rainwater. one was fréderic ruyuant’s prototype which had three long pipes with shower heads at the end of each, extending from a toilet’s water tank. ruyant asks, ‘rain comes to us from the sky, it waters our soils and fertilizes our land. what about rain water in our urban environments, which disappears into the bowels of the city before flowing back into our rivers?’ his protoype acts as a visual metaphor for this situation. ruyant believes that we need to detach ourselves from ideas solely of profitability and start thinking practically by coming up with responsible solutions for our environment. the rainwater collector is meant to bring attention to the issue of saving rainwater, but in an amusing way. he tries to make it fun to take care of our surroundings.